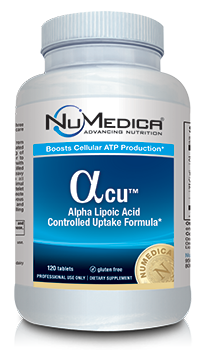 NuMedica Alpha CU Alpha Lipoic Acid is a powerful source of alpha-lipoic acid, a natural antioxidant that is produced by the body. Many people take an alpha-lipoic acid supplement because it may provide such important benefits as cardiovascular support, liver protection, blood sugar regulation, increased energy, strengthened immune system health, and much more. With its anti-aging benefits, NuMedica Alpha CU is a popular nutritional supplement that can enhance your overall health with its many antioxidant protections. With its zinc, biotin, and vitamin C, this supplement can provide an extraordinary level of nutritional support. As an important anti-oxidant produced by the body's cells, alpha-lipoic acid plays an essential role by helping to convert glucose into energy. These antioxidants, like others, also help reduce the presence of tissue-damaging free radicals that occur during the process of turning food into much-needed energy. Free radicals, as many people have learned, are associated with the aging process and disease onset. By boosting the body's antioxidant protections, these free radicals can be more efficiently routed out of the body before they can harm the body's healthy cells and tissues. 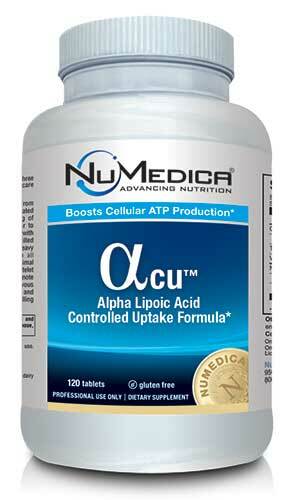 Medical research has also determined that alpha-lipoic acid can reduce blood sugar levels. Scientists also think this antioxidant can diminish the free radicals associated with neuropathy, nerve pain, associated with diabetes. More research is underway because scientists suspect that this antioxidant can benefit patients by diminished symptoms associated with other diabetes-related conditions. When it comes to your skin, alpha-lipoic acid has been shown to reduce the appearance of fine lines. Because of this and its ability to keep people feeling energized and less prone to fatigue, it's often praised for its anti-aging benefits. Like many other antioxidants, alpha-lipoic acid can help support the immune system so that it can more effectively fight off viruses and infection. Other Ingredients: Dicalcium phosphate, MCC (microcrystalline cellulose), hydroxypropylcellulose, stearic acid, magnesium stearate, silica silica dioxide. Warning: Consult your physician before use if you are allergic to alpha-lipoic acid or if you are thiamin deficient. Diabetics, those being treated for serum glucose control and women who are pregnant or lactating should consult their physicians before using this product and take appropriate precautions. TRAACS and The Albion Medallion design are registered trademarks of Albion Laboratories, Inc. Malate covered by Albion International, Inc. U.S. Patent 6,706,904 and patents pending.Alpha CU™ is produced under U.S. Patent #8,609,165 B1.